I get emails from my readers on a daily basis. I get offers to drive their personal rides on a weekly basis. I tend to say “No, thank you” for a variety of reasons, mostly because I’m too busy to take on another vehicle. But occasionally, I get the Godfather offer. The kind I can’t refuse. 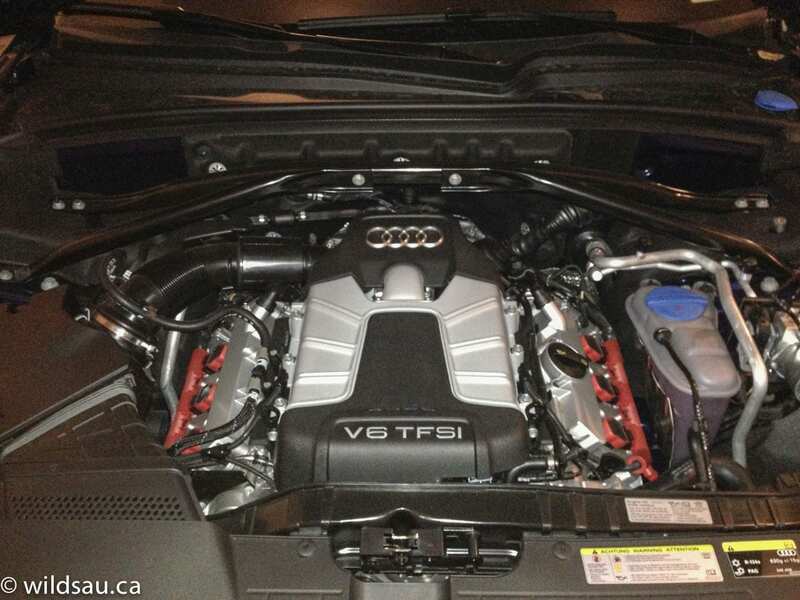 A couple of weeks ago, I got an email from a reader who had just taken delivery of his 2014 Audi SQ5 – it only had 600 km on it – and was wondering if I’d be interested in reviewing it. I tried to play it cool, but everyone knows I’m an Audi guy. Top it off with an S model, and one that’s brand new to the market to boot, and I couldn’t respond quick enough. 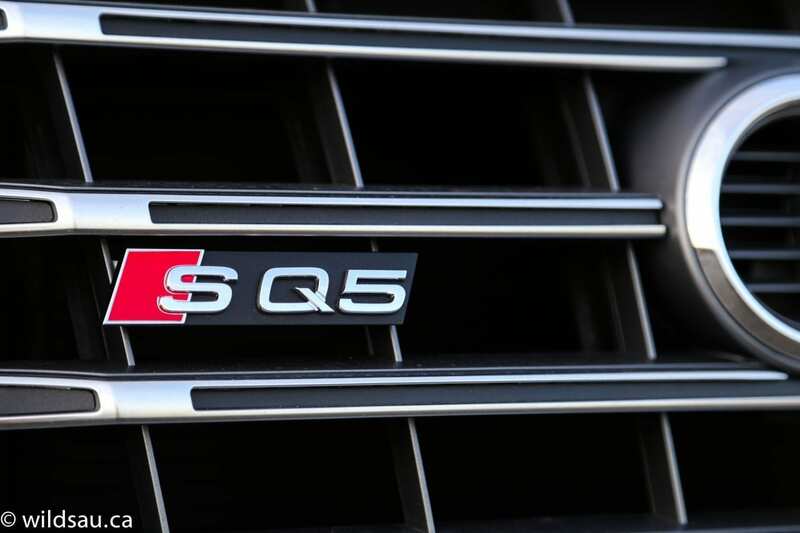 Audi’s S-models are performance-oriented versions of a normal model – in this case, the SQ5 takes the already-lovely Q5 crossover and infuses some S-someness into it. The most obvious infusion is under the hood. 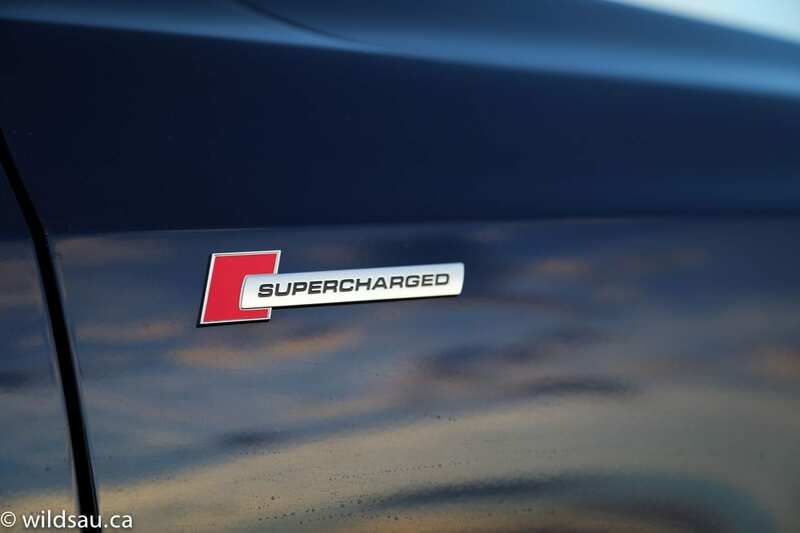 It sweeps away the base model’s engine options – the aging but still great 2.0T, the hybrid, the fantastic TDI diesel and even the lesser supercharged 3.0 L – and replaces them with a stout supercharged, direct-injection 3.0-litre V6. How stout? 354 horsepower at 6000 RPM and 347 lb.ft of torque at 4000 RPM stout, that’s how stout. All that goodness makes its way through an 8-speed Tiptronic transmission to all four corners via the legendary quattro all-wheel drive. Obviously fuel economy isn’t the goal here but it does alright – it’s rated at 13.2 L/100 km (18 mpg) in the city and 8.5 L/100 km (28 mpg) on the highway. The owner is averaging 13 L/100 km (18 mpg), and with 1300 km on the odometer when I returned it, this vehicle isn’t nearly broken in yet. Audi always gets fuel tanks right – this one holds 75 litres. The point with S-models is, as noted, the performance. And perform the SQ5 does. When you fire it up, you are rewarded with an immediate sonorous snarl. It does settle down to a burble after a minute, but at that point, you’re likely rolling. The torque is immediate. I love that, regardless of how you’re driving, the juice is on tap. As you putter around town, there’s simply no hesitation. Off the line, it’s a quick tap and you’re moving – no lag, no drama. Want to lay waste to the hoser beside you at the red light? Hammer on it, and the V6 snorts through the gears like a thoroughbred, galloping to 100 km/h in 5.3 seconds. And it doesn’t stop there. Cruising on the freeway and need to get by the beige Corolla taking up real estate in the left lane? 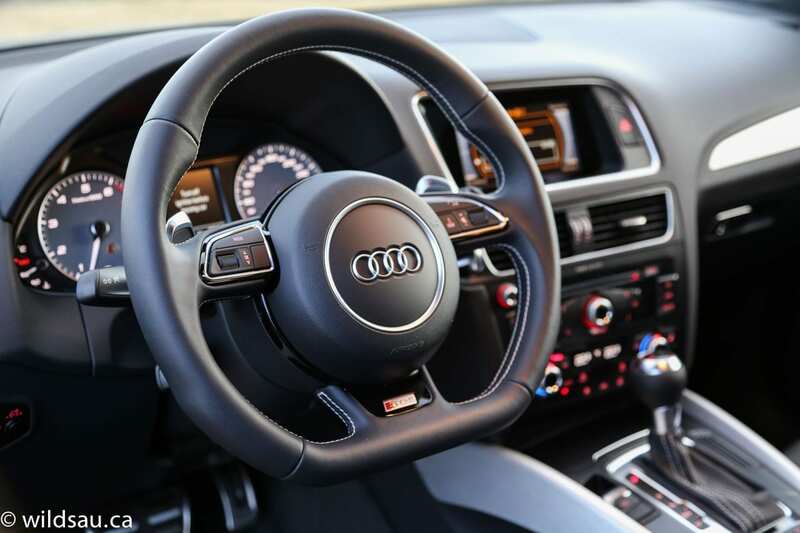 Long before you get the gas pedal to the floor, you’ll be treated to a crisp downshift to the exact gear you wanted (an impressive feat as it is) and immediate forward momentum. Not just momentum, but a hard pull. It’s easy to appreciate a power train that is docile but ballsy around town, and willing to run with the big dogs the moment you ask it to step up to the plate. At first, I was disappointed to find that the transmission isn’t Audi’s spectacular S-tronic dual-clutch. After driving the SQ5, however, I believe the Tiptronic is actually the right answer here. It is unflappable – however I drove it, it seemed to be in the right gear. Gear shifts are completely imperceptible, regardless of whether you’re burbling slowly to soccer practice, or whether you’re on it, full throttle. The gears can be shifted manually with the gear selector or paddles, and the shifts are actually quite quick, but I found the transmission’s Sport mode to be most rewarding. It will hold gears as long as it feels it needs to, and sharpens the vehicle’s responses very nicely. The handling abilities of this crossover are excellent. It starts with the electronic steering. Almost impossibly easy to turn at low speeds, it stiffens up significantly as you pick up speed, and makes for some pretty sharp, precise turn-in. Would I like more feedback? Of course. But considering this is a crossover, it’s a good compromise. 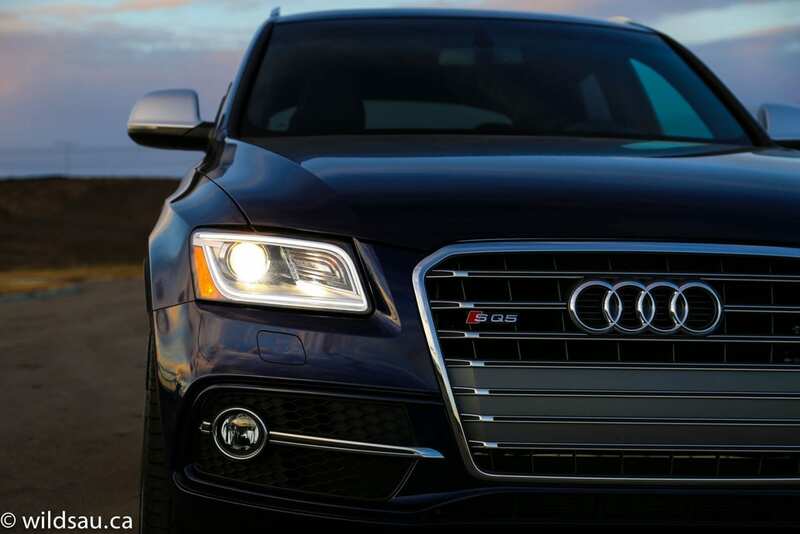 The SQ5 stays surprisingly flat as you toss it around. 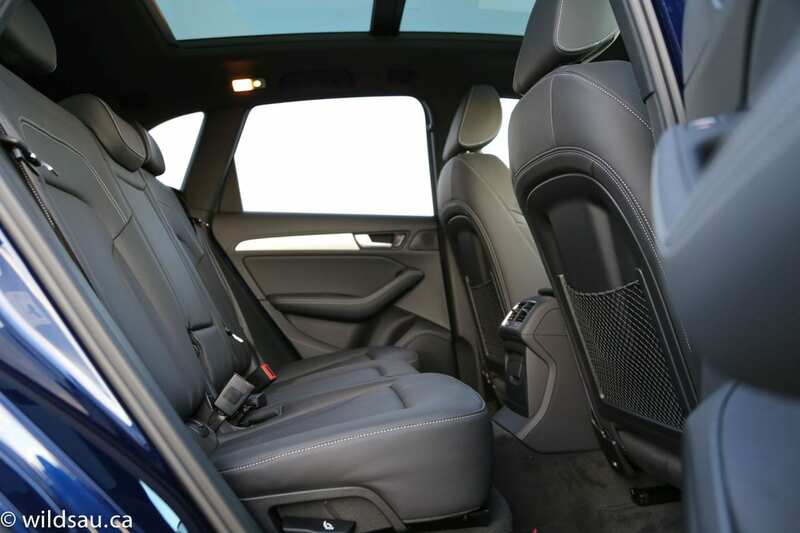 The SQ5 is a tall vehicle, with a seating position to match. You’re afforded a great view of the road ahead of you – actually visibility out of the vehicle is great from all angles. But that height becomes a bit of a disadvantage when you’re really throwing it into corners – it always felt top-heavy. Speaking of heavy, let’s address one of the SQ5’s biggest issues. This little porker tips the scales at 2000 kg (4409 pounds). I get that a well-built vehicle is going to weigh more. But this seems extraordinary. For the record, we own a Honda Odyssey minivan – it weighs 4475 pounds. You can feel the Audi’s weight. Off the line, though snappy, it feels as though this mass is holding it back from being the neck-snapper it could be. And when you’re sailing through twisties, it clearly carries the weight into the corners. I liked the ride – it’s firm, but never harsh. It always stayed comfortable, while reminding me I was driving a sporty vehicle. A perfect balance for me, though this might not be everyone’s preference. 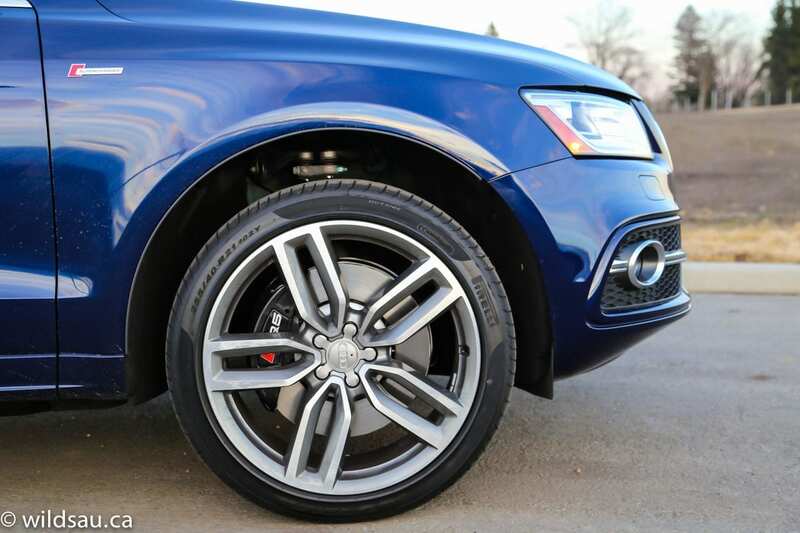 The SQ5’s brakes are powerful, and never got grabby. You can select your drive mode – normally you’d stay in comfort, but put it in dynamic mode, and you’ll find a heavier steering effort, a throttle response that’s tightened up somewhat and a transmission that seems to bang through the gears with a little more authority. Noise levels are well-controlled – engine and wind noise are never an issue. These days, Audi is subscribing to the “let’s engineer the intake and exhaust sounds” philosophy along with some other car manufacturers. So when you step on it, you’ll hear more from the power train. It’s all fine and dandy since it sounds great – it’s just that it seems silly to engineer the sound back into the cabin. Whatever. I did take issue with the road noise. I’m guessing the fat P-Zero tires are mostly to blame here, but what is a reasonable amount of noise in the city became quite aggravating at highway speeds. I’m still debating whether you’d just get used to the elevated road noise, or go completely crazy because of it. I didn’t really get to test out the quattro all-wheel drive, as the roads were mostly dry. It’s invisible during normal driving. I did notice a mechanical grinding at lower speeds, especially through the gas pedal. It’s not something horrible, but it IS noticeable. I also felt the same thing in a Q5 TDi I was driving in Ontario last week. There are other changes the S brings about – the exterior gets some additional goodies, such as S-specific air intakes and of course, as any S-aficianado will know, the quad exhaust tips in the back. 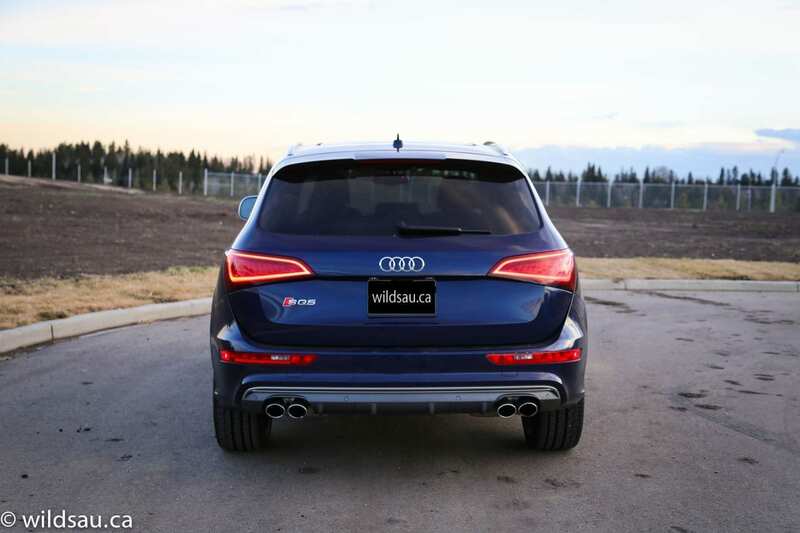 The Q5’s exterior already looks good without these touches, as it tries to move away from the boxy SUV styling. It benefits from slick lines and a look that seems to lean forward, as if it’s eager to get a move on. The front end has bright LED goggles for driving lights, and the tail lights are handsome LED triangles as well. The owner opted for 21-inch rims, which look absolutely stunning with their 255/40-sized Pirelli P-Zero rubber. 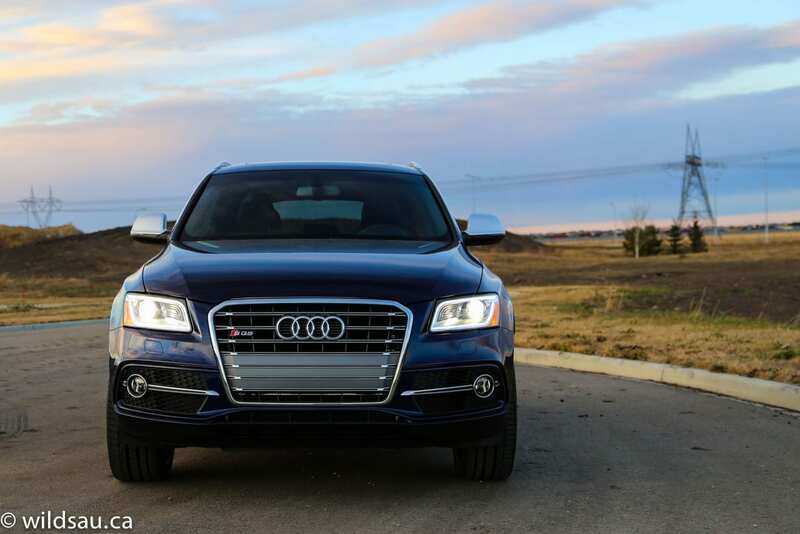 The Estoril Blue pearl paint is deep and luxurious, and suits the SQ5 perfectly. You’d expect nothing but a well-designed, beautifully crafted cabin from an Audi and this is no exception. Simple and clean styling, high-quality soft plastics, brushed aluminum trim – it all works together to create a happy place. That said, it’s a bit dark and sombre. Soberly Teutonic, if you will. I found the lovely-looking Nappa leather seats to be very comfortable, with ample bolstering. They’re power adjustable, heated and there’s a 2-position driver’s side memory. I really liked the adjustable knee bolsters too. Ahead of you is one of the best steering wheels in the industry – flat-bottomed, fat rim, small diameter – it’s great for touring and great for sport and looks cool. Behind it are two grey-faced gauges, separated by a driver information screen. The top of the centre stack houses a screen that manages the stereo system, phone and vehicle settings – it’s controlled by a rotary knob and four “corner” buttons. This is not my favourite user interface, but I did get used to it. The sound system feeds off of AM, FM, satellite, CD, USB and SD card sources and sounds pretty good. Underneath it is a dual-zone automatic climate control. 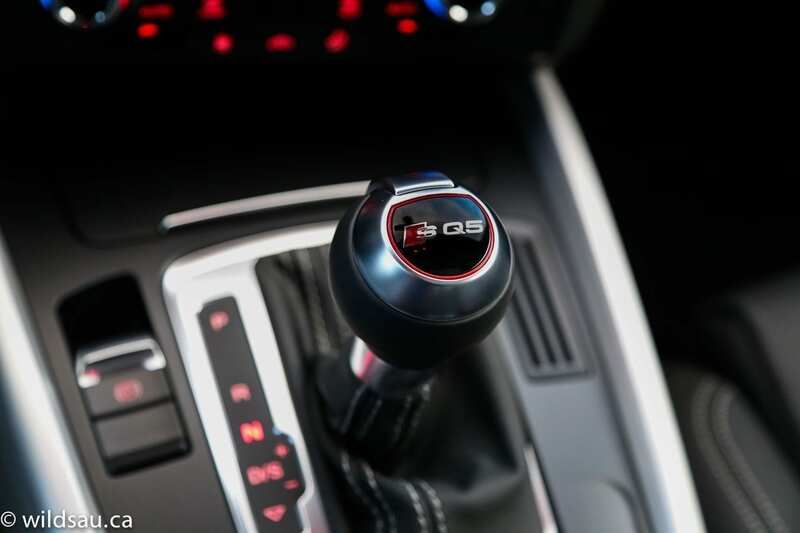 The console is home to the gear selector – another part that looks and feels great and would be at home controlling a manual gearbox in a sports car. There are also dual cupholders and an adjustable armrest which contains a 12V plug and hilariously, a CD organizer. I honestly can’t remember the last time I used a CD. At the back, you’ll find a power lift gate and overhead is a massive panoramic sunroof. The front panel tilts and slides and there’s a power sunshade for it as well. Here are the requisite three seats, each with a seat belt and a headrest. The seats are comfortable but quite flat, so there’s virtually no support for rear passengers in terms of bolstering. The outboard seats provide good headroom, legroom and foot room, and the seats slide fore and aft and recline. It feels even more airy back there because of the huge sunroof. As you’d expect, the middle position is a narrow, hard and raised seat. In addition, it straddles one of the biggest driveshaft tunnels I’ve seen, making it nearly impossible for an adult to use. The back of the centre console has adjustable air vents and a 12V plug, and the middle seatback folds down to become an armrest with two slide-out upholders. There are two sets of ISOFIX connectors for child seats – they’re easily accessible and much better than the typical LATCH anchors. Our three kids were comfortable width-wise, but the tunnel in the middle made it really tough for the kid in the centre. 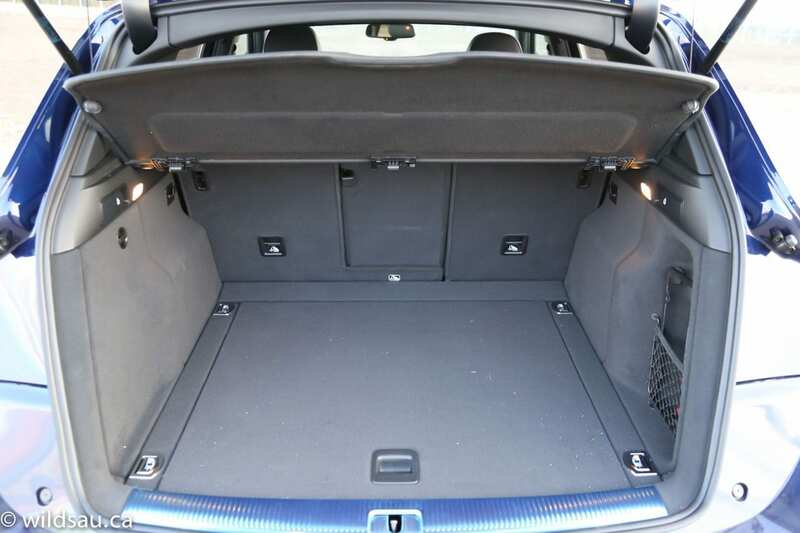 The SQ5’s trunk is large at 824 litres, and I really liked the wide trunk opening and load floor height. The rear seats split 40/20/40 – each side can be folded down with a handy lever in the trunk – and when they’re down, you have 1623 litres to work with. That’s a lot. There’s a hard parcel shelf that flips up with the tailgate, adding some storage space for road trips. I have to say, for $60 grand, the fact that there is no backup camera and no push-start ignition feels a bit chintzy. Also, if you want to talk about a really big deal – two grande Starbucks cups do not fit side by side in the cupholders. Don’t even talk to me about a venti beverage in there. This is life-altering stuff, people. 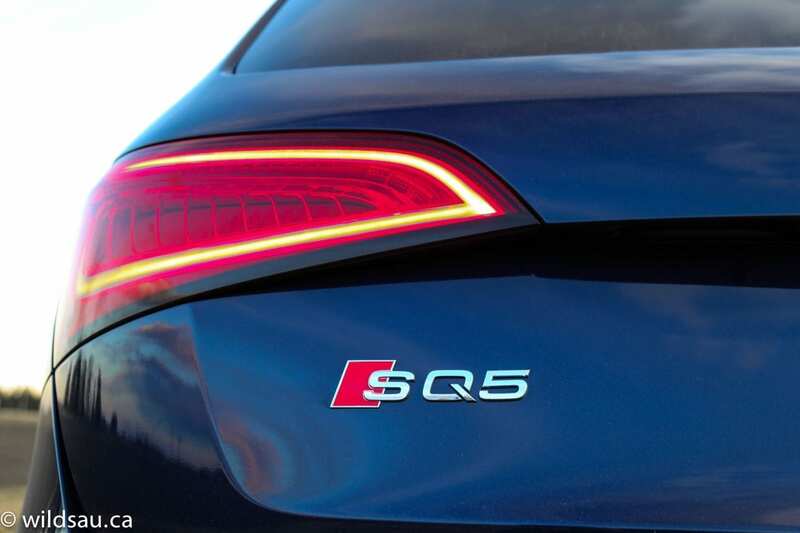 Audi got the SQ5’s performance aspect right. It won’t blow your hair back, but the performance is significantly better than the non-S models. Not only that, but they’ve managed to balance a great performer with a vehicle that is easy to live with and trundle around town with. It’s a great size for a vehicle, not too big, not too small, enough room in the back and in the trunk to offer true utility and flexibility and easy to park. 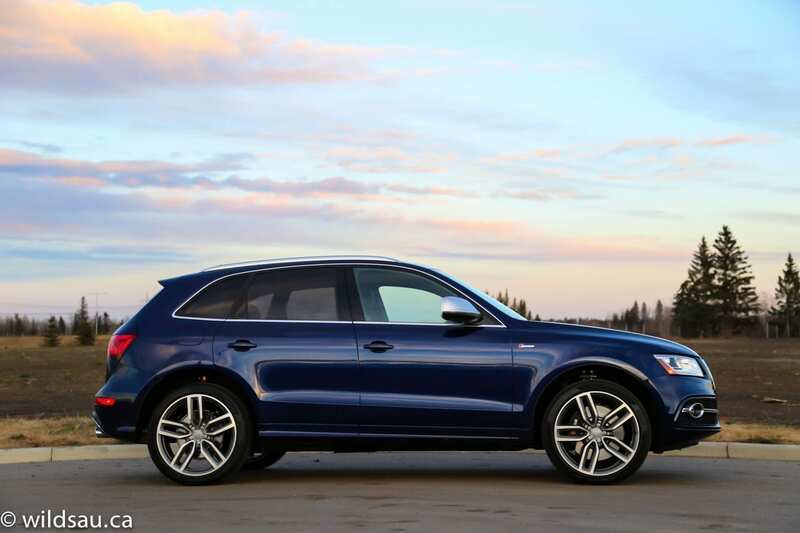 I give the Audi SQ5 an 8.5 out of 10. WAF (Wife Acceptance Factor) was sky-high. She loved the styling (and even commented on the handsome rims) and the performance. She found the size of the vehicle easy to live with, and liked the high driving position. 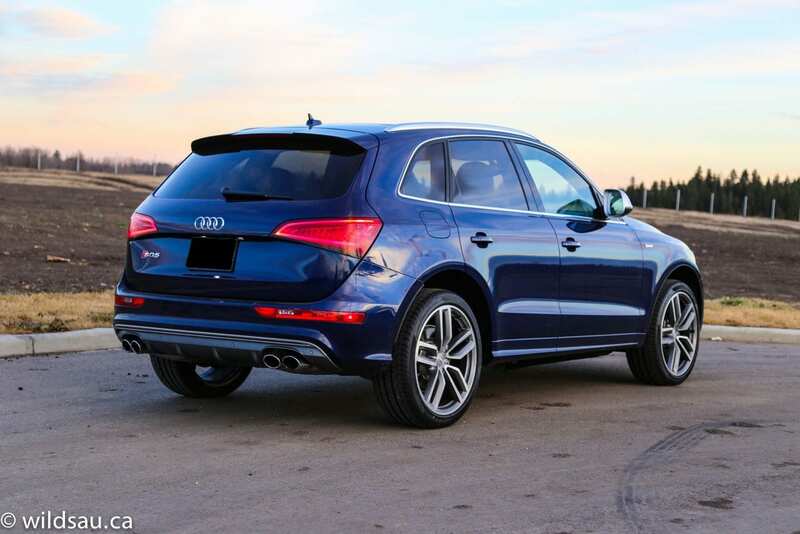 The price isn’t going to be for everyone, but if you’re looking at a smaller crossover that offers speed, balance, comfort and luxury and doesn’t sacrifice utility or good looks in the process, the Audi SQ5 is certainly one to put on your list. 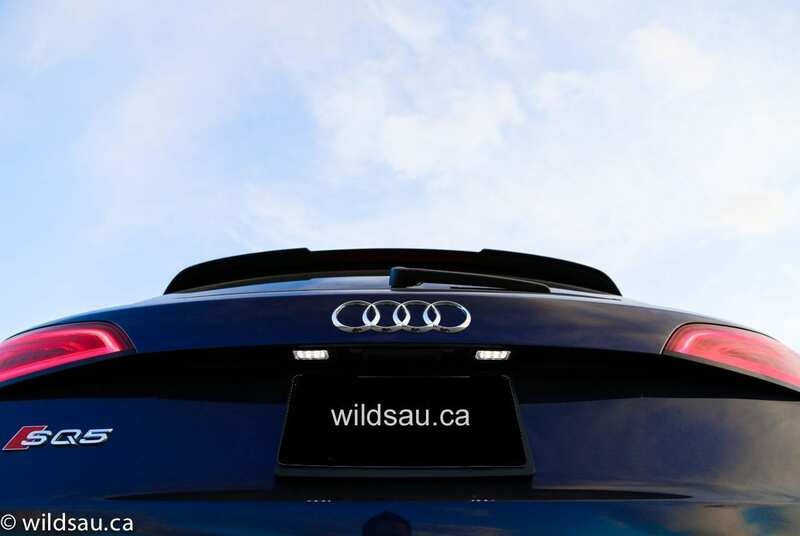 This vehicle was provided for review by a generous reader of wildsau.ca – I appreciate the trust placed in me by this individual, and the opportunity to hang on to and drive this nearly brand-new awesome vehicle for a couple of days. Thank you, kind sir!